Flipped on edge in unison. The craft moved in a rocking motion like a boat on swells. After launching craft the Mother-ship flipped to a vertical position and made a rapid upward ascent. Robert P. Sartin. The UFO, appeared to be about the size of a basketball court and had a thickness, one-half its width. The object looked like "one saucer inverted on top of another and had a row of flashing windows through its middle." It had red, white and yellow lighted windows and hovered in the area overhead for about 10 minutes, before it flew sideways, then moved up and away at an unbelievable speed as it disappeared in the sky. Source: J. Allen Hynek, Philip J. Imbrogno & Bob Pratt, Night Seige: The Hudson Valley UFO Sightings, p. 151. 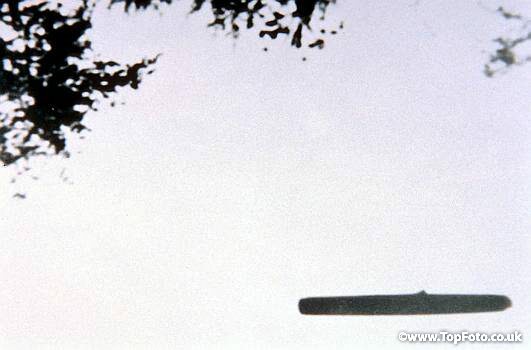 Astronomer and UFO expert J. Allen Hynek, accompanied by field investigators Philip Imbrogno and Dennis, saw a "Ferris wheel" shaped UFO in the sky in Hudson Valley, New York that turned on its side and then disappeared. It came in high and on its side (which made him think it was a balloon). It crossed the street and did a lot of erratic things over the field (dipped, slowed, sped up, circled) then took off smoothly and rapidly over some high- voltage lines, and off into the horizon in the east. When it flipped to one side, it appeared shiny. David D. Approximately at 60 meters altitude it reduced speed and turned on its side and climbed into the air.